Despite its title. with its echoes of ancient Scandinavian epic poems, this musical ‘fairy tale’ tells no specific story. 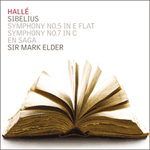 In later years Sibelius claimed that the work’s atmosphere was a revelation of his own character: if so, this is surely a journey of a soul through a supernatural landscape. At the same time, as Sibelius’s first important score to reveal a distinctively Finnish character, En Saga was the work with which the national music of Finland became an artistic entity.